The American flag patch should be placed on the arm as if flowing in the wind. 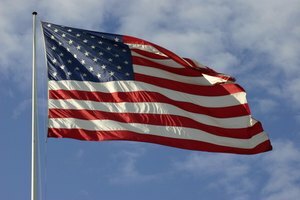 President Franklin Delano Roosevelt signed the official United States Federal Flag code in 1942, which includes instructions and rules for how to use, display and show respect for the flag. There are no fines or penalties for violating the Flag Code and observing it is voluntary; military institutions abide by the code as a display of respect. 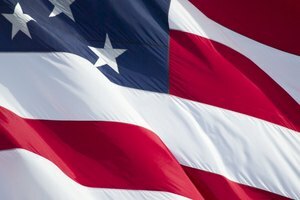 According to the U.S. Federal Flag Code, the American flag cannot be worn as a costume or athletic uniform. 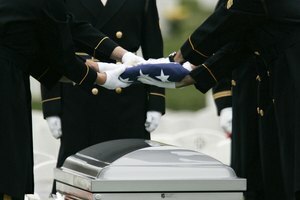 The image of the flag can appear on shirts, jackets or other garments, but these garments should be treated with the same respect as the flag itself. The U.S. Flag Code states that it is acceptable to affix an American flag patch onto military, police, fire and other patriotic organizations' uniforms. The flag patch is usually affixed on either sleeve, just below the shoulder seam. Most organizations face the flag with the union toward the front of the sleeve and the stripes running horizontally toward the back. This gives people the impression that the flag is flowing in the wind, as if being carried into battle. Another way to don the American flag on a military or civil uniform is with a lapel pin. 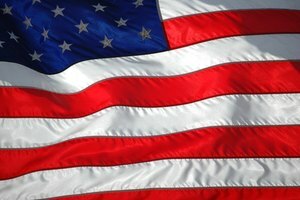 According to the Flag Code, the American flag represents a living country and should be considered a living thing. To show respect, a replica of the flag on a lapel pin should be worn close to the heart on the left lapel. 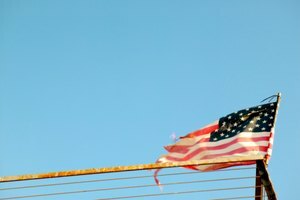 If the U.S. flag becomes soiled, it can be cleaned according to its material. 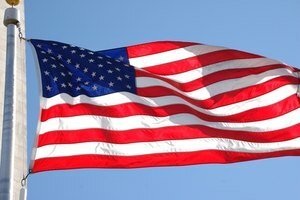 If the flag is no longer in condition to be displayed, it should be destroyed, preferably by burning, according to section 8(k) of the Flag Code. These suggestions are true for a military uniform bearing the American flag patch or a T-shirt with a U.S. flag image. If the fabric cannot be safely burned, it is acceptable to respectfully bury the item. Dyke, Kimberly. "Flag Etiquette on Uniforms." Synonym, https://classroom.synonym.com/flag-etiquette-uniforms-15507.html. Accessed 24 April 2019.